When a main character looks like something that walked out of Donnie Darko and wanders a bizarre, natural world that must be Samorost's neighbor, you know things are about to get more than a little surreal. 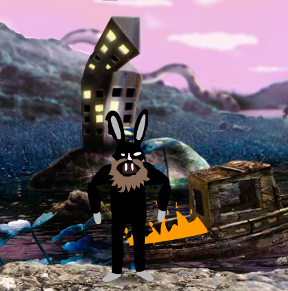 Antennaria Games delivers that surrealism in spades in A Rabbit Fable, a point-and-click adventure where one rabbit's fanciful reality, dreams, and memories all meld together. Click to move around, collect items, or interact with other characters and objects. The lack of a changing cursor leads to the occasional pixel hunt, however, most important areas are easily distinguished from their background. Many of the puzzles require solving some bizarre concepts, but are not nearly as difficult as they first seem. Often, they can be solved by simply collecting and combining items in your inventory and delivering them to the right characters. For a story with a protagonist that has no real dialogue, there are some surprisingly emotionally engaging moments. It's hard not to feel a pang of regret when you see the poor rabbit's head hang in dejection as he peddles off pieces of the one thing left he holds dear. Having to constantly trek back and forth at a frustratingly slow pace hinders that immersion, but the charming moments of levity draw you back in and keep the tone from going stagnant. A lot more can be said about this short story of a lonely soul who only seeks love and greener pastures, but A Rabbit Fable is odd, imaginative, and special in a way that needs to be experienced rather than told. A Rabbit Fable Walkthrough now available! Click the white rabbit standing in the corner of the room. Walk two scenes to the right until you reach a line of people waiting in front of the gate. Click anywhere at the right side of the area to stand in line. After the cut-scene, your character will be sent to the Pit. Pick up the yellow and red striped L-SHAPED BLOCK (1/3) on the ground at the right side of the pit. Next, grab the blue and yellow polka-dotted HORIZONTAL BLOCK on the left side of the pit. Click the floral patterned block at the top of the pit to reach for it. The old man will knock it to you, adding the V-SHAPED BLOCK (1/2) to your inventory. Try to grab the block on the ground in front of the cat. When you approach the block, the blue cat will swallow it. Take the blue and yellow polka-dotted VERTICAL BLOCK on the floor below the left side of the vendor's stall. Walk to the right until you come across three treehouses with tall doors. Knock on the left door first. The person behind the left door will request a triangular item. Combine the V-SHAPED BLOCK and the HORIZONTAL BLOCK in your inventory to create the TRIANGLE. Use the TRIANGLE on the left door to give the item to the resident. Walk further to the right and pick up the pink V-SHAPED BLOCK (2/2) on the ground below the third door. Pick up the dark blue L-SHAPED BLOCK (2/3) on the ground above the old woman. Now, knock on the middle door. The person in this home will ask for a square item. Add the two L-SHAPED BLOCKS together to make the SQUARE. Deliver the SQUARE to the person behind the middle door. Move past the right door and take the BALL OF YARN that drops down from the branch at the side of the treehouse. Go back to the cat at the left side of the area. Give the BALL OF YARN to the cat to make it spit up another L-SHAPED BLOCK (3/3), which is automatically added to your inventory. Return to the third treehouse on the right and then knock on the door to speak to the person inside. This person will request a pentagonal shape. Combine the three remaining blocks in your inventory: the L-SHAPED BLOCK (3/3), the V-SHAPED BLOCK (2/2) and the VERTICAL BLOCK to create the PENTAGON. Use the PENTAGON on the right door to sell it to the person for one GOLD COIN. Walk all the way left to the vendor's stall. Give the GOLD COIN to the vendor in exchange for a white hat. Now walk all the way to the side of the area, then open the door to the factory building full of machinery. The rat inside the building will only let you in if you are wearing the white hat from the vendor. Move to the right to find the tower. Try to open the front door to find that it's locked. Now you can walk to the left side of the area where a key has appeared on the ground. Click the key to attempt to pick it up, which will cause it to burst into flames. While the key is burning, click it a second time to light your hands on fire and add the FLAME to your inventory. Click the boat to touch it with your burning hands and light it on fire. Continue right to the tower again. Use your FLAME on the egg in the top right window to hatch it. After the bird flies from the egg, click the crying rabbit in the upper left window to receive a TEAR. Light the key on fire by clicking it, then douse the flames using the TEAR. Click the key again to try to pick it up. Reveal the cookie-eating rabbit by clicking the lower right window. Click his tray of food to receive a COOKIE. Use the COOKIE on your character to eat it and grow in size. Walk back to the left side of the area, then click the KEY to add it to your inventory. Go to the tower and use the KEY to unlock the front door. Once you've opened the door with the key, the character inside will give you the HANDSAW. Use the HANDSAW to remove the lower left and lower right arms of the tower building, adding a V-SHAPED BLOCK and HORIZONTAL BLOCK to your inventory. Combine the two blocks together in your inventory to create the TRIANGLE. Give the TRIANGLE to the person behind the tower door. Just like before, click the white rabbit in the corner of the room. Walk right to the factory building and try to open the door. The rat inside the room will tell you to get a polka-dotted hat in order to enter. Go to the vendor stall at the left side of the area. Click the vendor to talk to him. While he's distracted, take the CUP OF COFFEE on the counter. When the vendor stands back up, he'll request a gold coin in exchange for the hat. Return to the right side of the area. Use the CUP OF COFFEE on the drinking man with the wind-up key in his head. The cup in your inventory will be transformed into the COFFEE MIXED WITH SOMETHING GREEN. Move to the first treehouse on the left. Deliver the COFFEE MIXED WITH SOMETHING GREEN to the person behind the door in exchange for a GOLD COIN. Go back to the vendor and give him the GOLD COIN to receive the polka-dotted hat. Walk to the factory and open the door. Enter the cave inside the hill in the background. Your character will exit the cave, leaving the first copy of himself behind. Go left towards the fog to find the pieces of the destroyed tower. Click the tower door to open it. Pick up the DEAD SNAKE that crawls out of the door and moves to the ground on the left side of the half-buried clock. Use the DEAD SNAKE on the piece of rubble with the broken window to leave a second copy of the rabbit. Move right to find the stone building with spinning gears. Enter the building to leave a third rabbit copy behind. Walk all the way to the left, then click the white rabbit standing at the edge of the scene. I don't know who you magic pixies are, but I sure like your pixie drink. I enjoyed the game, and thought that for a first effort it was well done. Some glitches with movement that I hope they work out in the future. Clicking on a destination can send Rabbit on an odd course. And his movement could have been sped up a bit. The artwork, music and sound are exceptionally good, and kept my interest level up enough to overlook that. Enjoyed this. I think the slow-paced walking adds to the dream-like quality of the game and to me, doesn�t need too much speeding up -- (maybe just a little), or perhaps the rabbit�s path could be straighter. Only issue I had was the inventory box would not always close and so I missed some of the story�s animation. First and foremost, I commend those who are able and creative enough to make games for others to enjoy. That being said, this particular attempt missed the mark. I have played many other games with dream/fantasy themes and, although not my particular bag of worms, this genre is prevalent enough to warrant a pass for content. However, the monotonous back and forth from one side of the screen to another...at a such a ridiculously slow pace and such off-the-mark character movements, made this game almost unplayable. For sheer want to not leave a game incomplete, if possible, I trudged through to the end. Whew! My apologies if I have hit a nerve with some folks (having a negative opinion seems to do that), but the truth shall set you free! I see the storyline differently, Zeke! The black rabbit at first just wanted to be loved, and thought being successful at what he liked to do would lead to being loved, and being somewhere nicer. So he enters his model house in what looks like some kind of competition... but his house is the opposite of what the judge wants, so much that it's laughable. In the pit, he needs to peddle off the parts of his house to get anywhere, but he can finally give important people what they want, even if he's no longer being true to his dream. He even finds a way to get a production line and employees! Life is good for him, maybe. But then he has a dream. Here's his house, full-size, complete with friendly neighbors who like him. But to get inside, he has to compromise himself, make his new friends hate him, and even destroy his house. But look, he's appeasing the important people, this must still be good... except when he gets inside, when he can finally be loved, he realizes his "dream girl" is an empty ideal, and making all these sacrifices to be successful is destroying what building his house originally meant to him. So he goes back, shuts off the assembly line, and leaves. He needs to let go. He's invested so much time and energy and work into this dream of building a house and being successful, and since he's not sure he can make that happen anymore, he needs to step back and make peace with it. And then he meets someone. Someone who's not an abstract dream girl, but an individual. And he didn't need to rise to some arbitrary level of success to deserve her... love just happened because they were in the right place at the right time and they liked each other. With the support of another person who cares about him, he works toward his dream. It's not quick, and it's hard work, but together they can make it happen and they're happy at the end. I guess I could make some feminist nitpicks LIKE ALWAYS, HUH, but I thought it was a really sweet story with a good moral and I liked it a lot. I didn't have issues with walking paths like some people did, and I thought maybe the rabbit could have moved more quickly, but I'm glad I got to play this one. New version now online: that fixes some of the bugs players have been experiencing. Hi, I'm the developer, thanks a lot for the comments. Thanks Trinn for the review! @Zeke: it's an alienated work...why I have to develop pieces of software for companies that I don't know even in which country they are located? I want to make games, they want stylized boxes...(it's personal, so it's my game). But I'm glad you could finish it, and you still like it, that's important for me!. @HammyJay: your comment it's totally welcome!, it's a personal game that was turning in my head, it's not as arbitrary at it seems, but I understand looks very cryptic. Thank you for stopping by to provide some feedback! That the story is an allegory for game development? It seems the character seems to waver back and forth between pursuing personal fulfillment or financial success at the cost of conformity. In particular, I found the scenes in which the protagonist has to take the broken pieces of his rejected idea and watch the "consumers" hands rub off all the pattern, color, and creative identity from them very moving. Even more so when he abandons his independent work to go to the factory that churns those blank, empty pieces out to meet consumer demands. @Trinn: yes, is as clear at it sounds. It's not really an allegory of game development itself, any kind of 'creative' work can be frustrated with the real 'productive' demand. And in the dream scene you experiment the total 'burnout' a cause of the work: each action it's a metaphor of that feeling...but I don't expect people could stop in an online game to over analyzed. I'm actually very pleased that people have interpreted the game so deeply. Thanks (and sorry for my English). I hatched the egg, the bird flew away, but I didn't get the tear. Now I can't walk to the side, the screen's stuck on the tower.